An overview on what you need to know about Afternoon Tea. 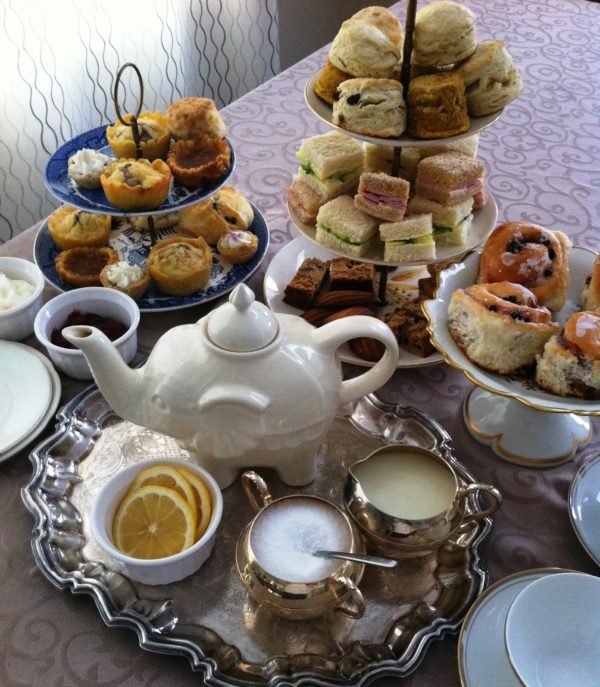 Afternoon Tea is arguably the best contribution the British have made to cuisine. A lovely tradition My upcoming new book will provide all you need to know, whether you are planning to visit a famous tea house in London, organizing a fundraiser or just hosting a tea at home. This article provides highlights on history, what to eat, how to eat, when to eat!. Enjoy. In 1662 Catherine of Braganza of Portugal married Charles II and brought with her the preference for tea, which had already become common in Europe. As tea was her temperance drink of choice, it slowly gained social acceptance among some of the aristocracy as she replaced wine, ale and spirits with tea as the court drink. It did take some time though to ween courtiers from enjoying ale at breakfast. Baby steps. 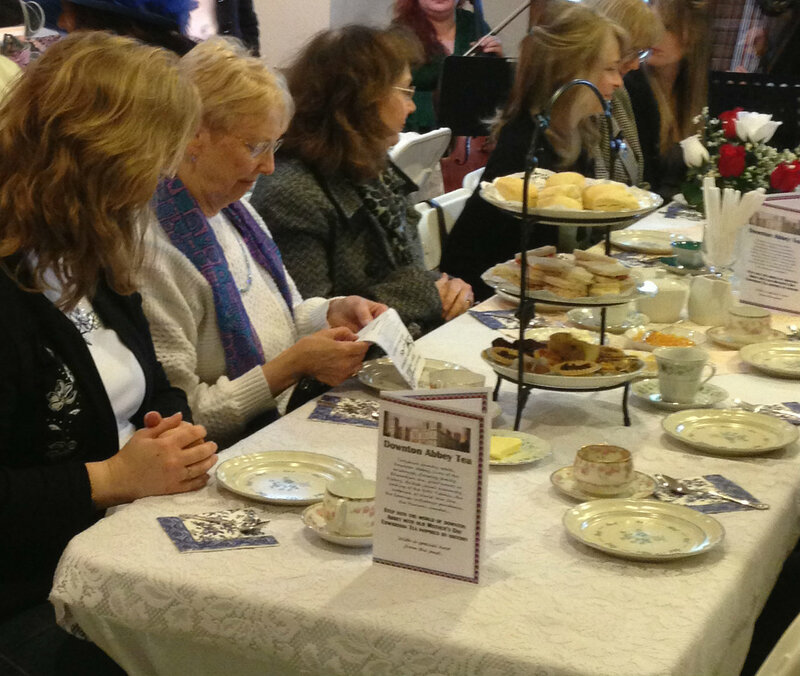 The actual taking of tea in the afternoon developed into a new social event some time in the late 1830’s and early 1840’s. It was Anne, Duchess of Bedford, one of Queen Victoria’s ladies-in-waiting, who is credited for first “inventing” Afternoon Tea, but actually it had been a gradual evolution. The gap between lunch and supper was widening, so Anne started asking for tea and small cakes to be brought to her private quarters. I am sure she quickly realized that a lot of gossip could be shared if she invited other ladies to her quarters to share her cakes. Queen Victoria herself was encouraged to start hosting her own parties as a way of re-entering society after the passing of her beloved husband Albert. Legend has it that Victoria Sponge was named and served at her tea parties which became large affairs. Other women picked up the idea and spread like wildfire. Thus the ritual of afternoon tea began. Women do know how to get things done. There is nothing like enjoying tea with friends or colleagues. 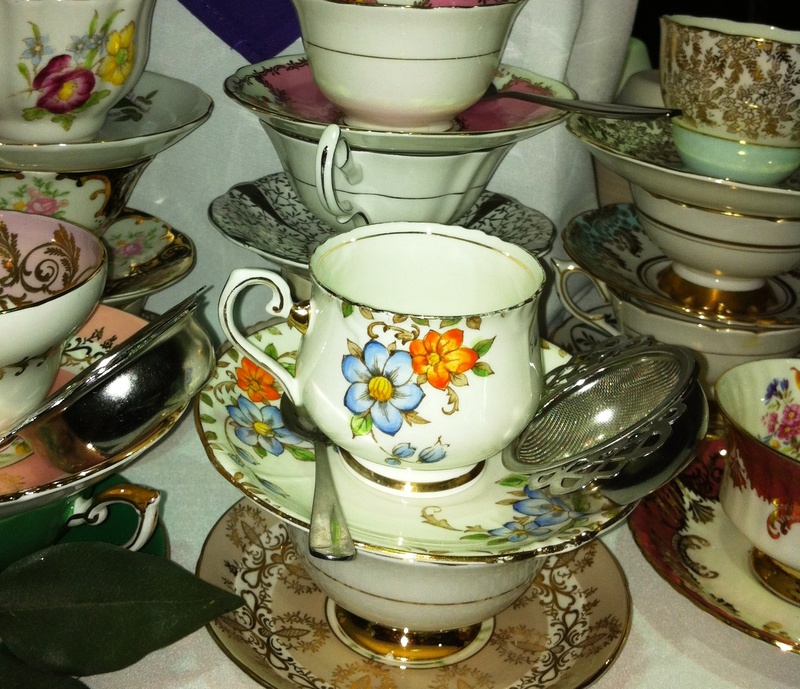 Check out my recent tv interview about hosting a tea party. 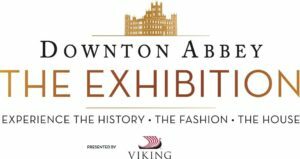 If you are planning a visit to the UK, watch Downton Abbey, Coronation Street, or other British type serials, it might be helpful to get proper knowledge of the terms used. Afternoon Tea — What we imagine all British teas to be. An afternoon meal, served typically from 4 – 6 pm, which includes the tiers of smart little crustless sandwiches, scones, clotted cream, curd, 2-3 sweets and heaps of tea. 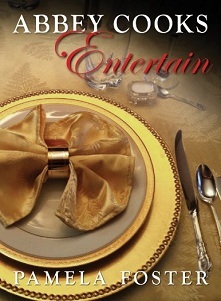 High Tea or Tea — High tea is eaten in “high chairs” at the dinner table. 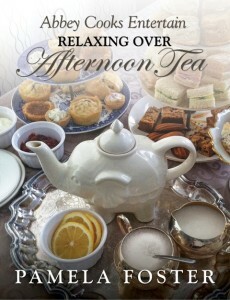 Afternoon Tea is traditionally served on lower couches and lounging chairs. High tea is actually is a meal that the working class had at the end of the day with cold meats, potatoes, as well as other foods with tea and perhaps a beer. Americans confuse the two, and since some London tea houses use the terms interchangeable to keep tourists happy, it adds to the confusion. Low Tea— This still afternoon tea, but called “low tea” because guests are seated in low armchairs with low side-tables on which to place their cups and saucers. Displaying acceptable manners is a way of fitting in with a certain class. 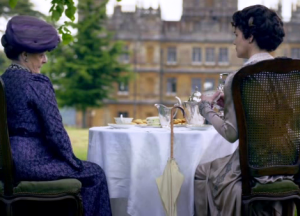 Pay attention to the “tea scene” in S1 E2 of Downton Abbey. 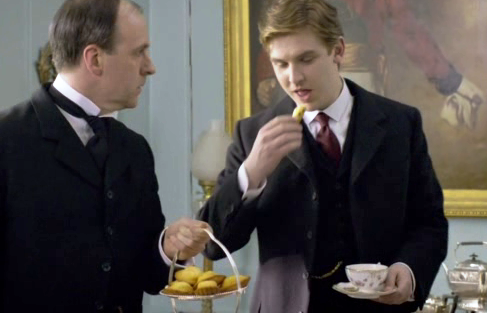 The new heir Matthew Crawley comes home to find visitors, and decides to help himself to tea and madeleines. 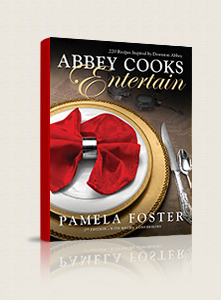 Molesley, the butler, is horrified and his mother, the Dowager and Cora embarrased. 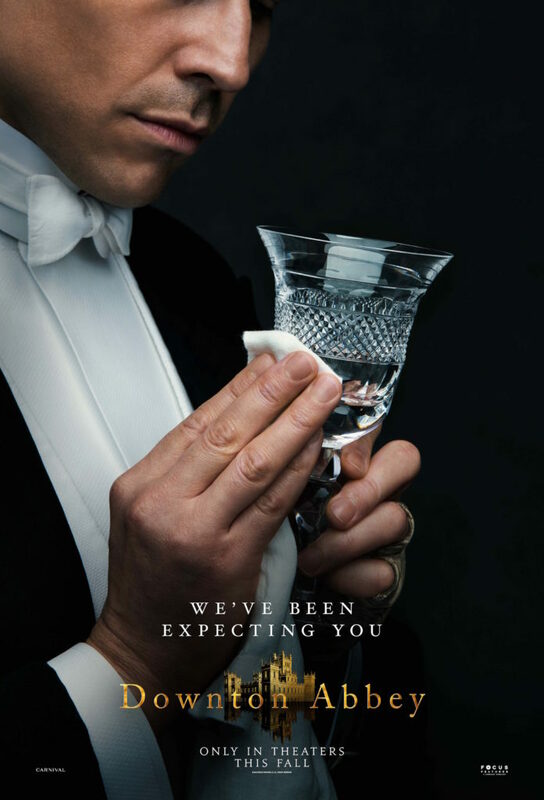 Yes, it is evident that this middle class lawyer is a diamond in the rough, and has a long way to go before he will become a true gentleman, but we gradually see him growing into the role of heir apparent. If you plan to enjoy the tea ritual in London or your home town, book an Afternoon Tea (not High Tea), and do take note of proper manners to fully enjoy the experience. 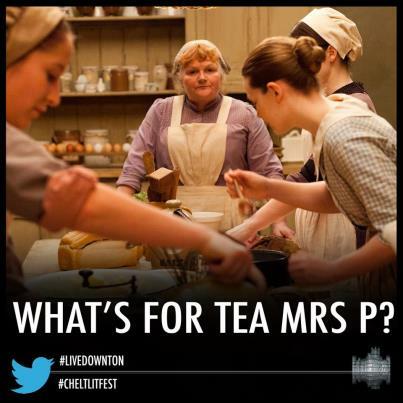 In London, they do try to do things properly, which is why we adore Downton Abbey in the first place, right? Sugar/lemon —tea is poured first, then sugar or thinly sliced lemon and never milk and lemon together as it will curdle. Who Pours? — If you are the hostess, you should pour. If you are taking tea at a tea house, it is the person who is closest to the pot when the pot is brought to the table. Proper placement of spoon — the spoon never stays in the cup. The correct order when eating on a tea tray is to eat savouries first, scones next and sweets last. We have changed our order somewhat. We like guests to eat the scones first while they are hot, then move to savouries, then sweets. Scones — the most practical approach according to Debrett’s is to split the scone horizontally before adding your favorite spreads. Cream, then jam on scones? —This depends. Devon tradition puts clotted cream first on scones, then jam. In Cornwall, preserves first. Eat with fingers neatly. Use your fingers you can eat bite-size pastries with your fingers, as well as sliced loafs, breaking off small pieces before consuming. Use a dessert fork to eat larger pastries. No dunk zone — unless your tea party is very informal, dunking treats in your tea will garner a scowl. *Since ancient Rome, a cultured person ate with 3 fingers, a commoner with five. Thus, the birth of the raised pinkie was a perceived sign of elitism, however the The pinky “up” rule is actually a misinterpretation of the 3 fingers vs 5 fingers dining etiquette. 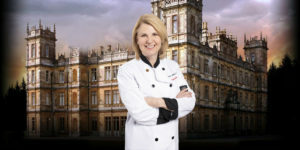 You will never see the ladies at Downton Abbey raise a pinky. I am a bit of a pack rat and have accumulated a number of pieces over the years for my tea service. Some I have inherited, a few are treasured gifts from friends, but many I have picked up at yard sales and thrift stores over the years. Your tea service does not have to match and in fact it works out better when each person has their own personal cup to keep track of. If you are keen on starting your own tea service, try checking out your local Goodwill store. You will be amazed at what you may find. Don’t get too stressed about making tea, particularly since much tea is now sold in tea bags. To distinguish yourself as a tea aficionado, however, just follow the time honored tradition of first warming the tea pot. Add a bit of boiling water to the pot, give it a swirl and pour it out before adding your tea. Steep 3 or 4 minutes and don’t let the tea steep too long or it will become bitter. If you go with loose tea, the general guideline is to allow for 1 tsp per person, 1 tsp for the pot, and allow 10 ounces per person. Use a tea strainer and pour into cups. You may wish to fill your tea pot with tap water, pour into a measuring cup to determine how many cups your pot will hold. Debrett’s also advises that you keep a heated pot of water nearby in case to help dilute tea if it is too strong. The following are the types of items you will find at tea. Follow the links to locate recipes for items we have prepared in our travels. Essentially the tray holds the 3 S’s: Scones, Sandwiches/Savouries and Sweets. I mostly focus on traditional tea items (great food always has a history). I am a big fan of healthy eating and while many of these treats are “sometimes” foods, but I also include healthy versions of some treats which you can enjoy anytime. The general rule to the tea tray is that items can be eaten by hand so are cut into bite sized pieces, and generally cold, unless you have scones right out of the oven.